What are you listening to right now? Me, I'm listening to the 2012 album Battle Born, by The Killers, specifically the song 'Runaways.' 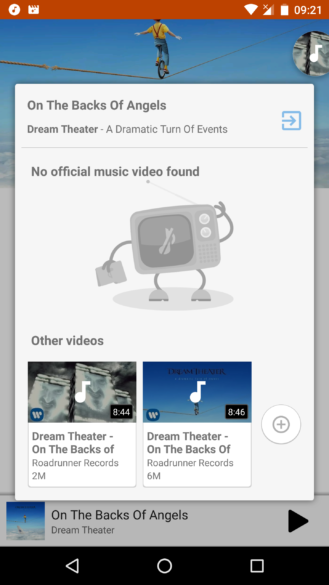 But what if I wanted to find the music video for that song? Now there's an app that can do that: Music Mate, from DJiT. Left: choose how the app notifies of a new music video result. Right: the list of music videos. Music Mate's premise is pretty simple. 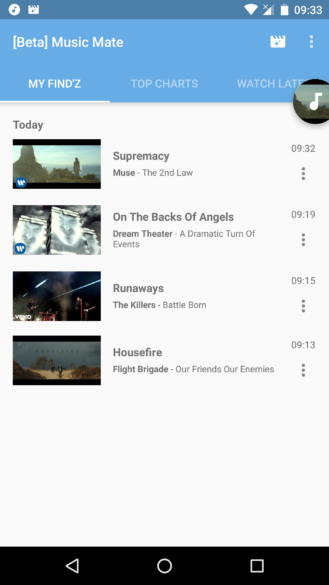 When playing music, it will identify what song is playing and find the relevant music video on YouTube. I've tried it for a bunch of different songs, ranging from rock (Muse's Supremacy), Indie Rock (The Killers' Runaways), Progressive Rock (Dream Theater's On The Backs of Angels), and some indie music (Flight Brigade's Housefire). In only one of these cases, it was not able to find the correct video - that being the On The Backs of Angels - although it did come up in the 'Other Videos' section. Every other time, it correctly identified and found the music video for the song on YouTube. 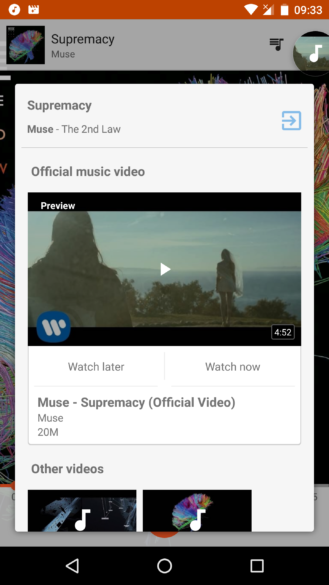 The result is shown either via a bubble, or a notification - the app offers a choice - and has a list of videos it's found, along with top charting music videos on YouTube, plus things marked as 'Watch Later.' Finally, a notification in the shade when a bubble is enabled has three self-explanatory options: info, open, and quit. Left: a correctly identified video. Right: an incorrectly identified video. Music Mate currently works officially with Google Play Music and Spotify, although other players may work unofficially. The app is currently in beta 'unreleased' state on the Play Store, so bugs may be encountered. Either way it's available on Google Play, so if you yearn for the days of MTV, this might be right up your street. 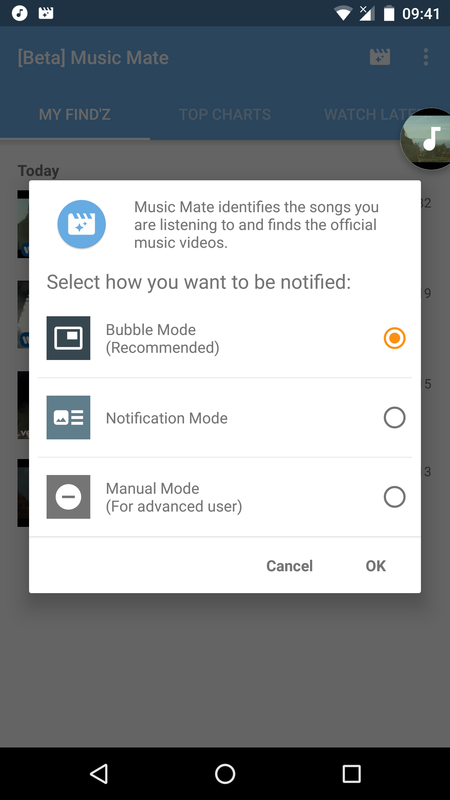 Music Mate is now out of beta and officially released on the Play Store (same link as below). The interface has changed considerably since we first looked at it, with black and orange replacing the white and blue dominant colors. There's also a new option to mark videos as official or non official to help the app find better content, and a way to follow your favorite artists as well.